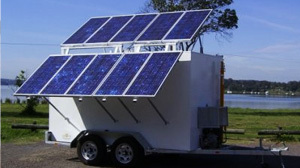 This unit is a fully transportable solar power system designed to supply relatively small remote houses, radio repeater equipment and other remote loads. Priced similar to an installed system of the same capacity, this mobile trailer system features 240VAC pure sinewave output and more than 4 days of battery backup capacity. The tilt angle of the solar array is fully adjustable to allow optimum power production through all seasons. It also folds down for ease of transport and storage. 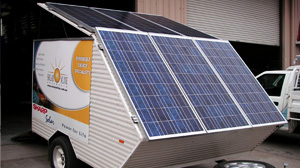 This enclosed solar trailer (built for a Government department) features a solar booster to allow the ten (10) BP Solar 125W solar panels to produce in excess of 5.5kWh per day of usable power. The solar panel arrays fold up onto the roof for transportation and are deployed with the assistance of the opposing array acting as a counterweight. This method allows one person to safely deploy the arrays. 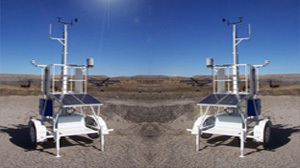 This mobile auto weather station (assembled by Zinifex Century Mine in QLD) incorporates one of our Industrial Solar Control Systems with 2 x BP Solar 50W Solar Panels. Systems such as this are ideal for remote radio repeaters, surveillance cameras, monitoring stations and other remote powered applications. 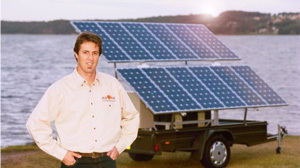 This mobile solar power system was developed to provide practical and renewable operating power to a portable 2700W sound system. The sound system output has now grown to around 7000W and the power system still manages to keep up. The power system features 6 x Sharp 123W solar panels, Outback MX60 MPPT solar regulator, Hoppecke 1600Ah deep cycle batteries and a Xantrex SW pure sine inverter charger. The trailer has enough capacity to run the 2700W sound system for approximately 40 hours and the 7000kW system for about 15 hours. 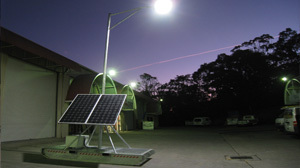 Our industrial solar lighting skid for remote lighting applications is programmable for up to 13 hours run time per night. 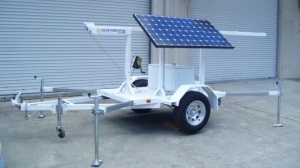 The LED light and solar panels are adjustable to any orientation, and the hot dipped galvanised steel skid enables the unit to be dragged into position by a 4WD vehicle. Primary components include 2 x LG 230W monocrystalline solar panels, a Blue Sky Energy Solar Boost 3024DiL MPPT solar controller and a Geltech deep cycle battery bank. Portable communications trailer used in mine sites throughout Australia. This solar trailer incorporates a purpose built vandal resistant lockable equipment enclosure and an 8m extendable mast for communications antennae. Primary power components include a 210W to 250W solar panel, a Blue Sky Energy Solarboost 3024DiL MPPT solar regulator and a Geltech deep cycle battery bank.